Carlos Alberto Reutemann is arguably the 2nd most famous Argentine Formula 1 driver after 5-time World Champion Juan Manual Fangio. For the first part of his racing story, from his humble beginnings to his time in Ferrari, please check the first part of the Ferrari article published recently. Sometime around the race in Austria in 1978 Scheckter became the new figure for Ferrari with a salary of $600,000 against the $150,000 of the Argentine with Villeneuve about to be shown the door. But Reutemann did not like the fact that he was going to be 2nd in Ferrari after all his hard work in the past 12+ months and with Colin Chapman not going to renew Peterson there was an opening in the mighty Lotus. Reutemann took the chance and apparently in the same day when they were going to tell Villeneuve that he was not going to race for Ferrari in 79 Reutemann was informing Enzo Ferrari that he was leaving the team. Such was the panic that Ferrari run out of the office to tell his 2nd in command not to fire Villeneuve as now they needed him! But conditions for Reutemann were not that good in Lotus: 2nd driver behind Andretti, the “muletto” (spare car) would not be available to him and also he would not be paid by Louts but by Good Year. Lotus would only take care of the bonuses/prizes. Reutemann and the Argentines had great expectations as he would be racing the successful Lotus 79 for a few races while the new Lotus 80 was being finalized. Colin Chapman from Lotus claimed that the 80 would make all the other cars look like London’s double decker buses. One of the Argentine journalists commented to Chapman that Reutemann was a great driver but that also needed to feel the team behind him…to what Chapman answered that he was going to give Carlos the best tools he had available…and also the address of a physiologist if in need. When Reutemann tested the 79 he felt that it was the best car F1 car he had driven so far. But the other teams had copied the technology (ground effect) and Ligier, Williams and Brabham were now catching up. Reutemann says that he found a Lotus team relaxed after winning the championship the year before and that it was a bad environment as the team was not as hungry as in previous years. On the other hand Chapman was developing the 80 which was taking the ground effect to the maximum while the development of the 79 was stopped notwithstanding that the later had still room for improvement. The new car was unstable (would porpoise like a plane and had dramatic changes in grip that were practically spontaneous) and moody and Reutemann decided not to use it after a while leaving Andretti to do all the development. With these considerations in hand let’s go to the F1 1979 season. Like always the first race took place in Buenos Aires, Argentina. The Ligiers of Laffite and Depailler dominated the Qualy to everyone’s surprise and the Lotus were on second row. The start was chaotic, the race was red flagged with several cars destroyed and when it restarted the Ligiers pulled away but Depailler’s car broke down. Laffite won, Reutemann came second and John Watson finished 3rd. Not a bad start of the season for Reutemann. The next race took place in Brazil. Again Laffite in Pole with Depailler 2nd and Reutemann 3rd at the start. Carlos overtook Depailler but then he lost the 2nd place to the Frenchman and then Andretti also left him behind. When Andretti pulled out with engine trouble Reutemann reclaimed the 3rd place and in this order the race ended with the Ligiers dominating the first 2 meetings. South Africa came next and Ferrari had their new 312T4 with ground effect on the track for the first time. And Renault introduced their turbo engine. This meant that the improved competition left Ligier and Lotus behind. The Ferraris dominated the race and Villeneuve came 1st with Scheckter 2nd and Jarrier 3rd while Reutemann finished 5th. Long Beach was next. Reutemann qualified 2nd behind Villeneuve and just ahead of Scheckter. But an electrical problem the morning of the race forced the Argentine to start from the pits and he eventually retired. The Ferraris dominated again and they finished in the same order as in South Africa. In Belgium the fight was between the Ferraris and Ligier. Reutemann qualified 10th but another good performance with a car that was starting to lag behind the competition got him a 4th place at the finishing line. In Monaco Reutemann started 11th. With a good drive and several retirements ahead of him the Argentine took 3rd place behind Scheckter and Regazzoni in the Williams. At this point Reutemann was 2nd in the standings only 10 points behind Scheckter. From this promising start, Lotus began losing ground. In France Reutemann qualified 13th and finished 13th with the Ferraris again showing a strong performance and the race being won by the Renaults with their Turbo engines. This was the last of the 3 races that the Lotus 80 was used and the model was retired for good with Andretti reverting to the model 79. In the Netherlands Reutemann started 13th but in the first lap retired with suspension problems…and a 3rd win for Jones in the Williams…4 wins a row for the British team that was showing that the answer was to copy the Lotus 79 and improve it and not a radical ground effect car like the Lotus 80. During the Italian GP Reutemann qualified 13th again but finished a little bit better (7th) while Scheckter returned to the podium as winner of the race. But Carlos was not happy at all with the internal situation in Lotus, estimating that it would take years for the team to reclaim their leadership. Thus when Frank Williams approached him to join his team and after seeing how much the FW07 had improved (eventually finishing with 5 wins in 1979) Reutemann decided to change teams again. Like in Ferrari the one that suffered the consequences was Clay Regazzoni who while taking a week to think about an offer from Williams for 1980 lost his place as Frank hired Reutemann in the meantime. The Canadian GP was another bad one for Reutemann…starting 11th the suffered again suspension problems on lap 23 and he was forced to retire. Williams won again with Alan Jones. The United States GP was the last race for Reutemann in Lotus. Having qualified 6th he crashed out on lap seven from third place when his fire extinguisher sensing unit came loose and interfered with his pedals. A very promising season ended bad. Reutemann’s replacement in Ferrari (Scheckter) became World Champion and the Argentine finished 7th in the overall standing with Andretti 12th. The Williams FW07 continued to be developed from the previous year and became the FW07b which is the subject of this review. The ground effect was improved and Jones and Reutemann worked together on the suspension and settings in such a successful way that the car raced sometimes without the need of the front wing. The 1980 season opener took place in Argentina on a very hot weekend in January. The racetrack was in very bad shape with the pavement falling apart and though some mends were done the bad shape the pavement was provoked several accidents or cars going off the track. Jones was the candidate and Reutemann qualified 9th. But soon he was in 4th place threatening Piquet in the Brabham BT49. Running one second a lap faster than the Brazilian it is clear that he could have overtaken him very easily and also he could have caught Laffite running in 2nd place. Regretfully an “excursion” to the grass (that had been cut recently but had not been removed from the ground) meant that the radiators on Carlos’ car got plugged with cut grass and the engine temperature started to rise until he was forced to retire the car on lap 12. Due to this concern Jones pitted and his radiators were also cleaned (a plastic bag was found there) and he was able to continue racing till he eventually won the Argentine GP. Brazil came next. Reutemann qualified 4th but in the 1st lap he was forced to retire due to problems in the halfshaft. Arnoux won the race in a Renault while Jones came 3rd. South Africa was the 3rd race of the season. Reutemann qualified 6th and Jones 8th. The race was won by Arnoux again in the mighty Renault while Carlos finished 5th and Jones retired with gearbox issues in lap 34. In Long Beach Reutemann started 7th with Jones 5th. On lap 3 the transmission of the Argentine gave up and later on Jones crashed leaving both Williams out of the race which was won by Piquet in the Brabham. After some weeks of rest Belgium came next. Jones started on Pole and Reutemann 4th. Pironi won the race followed by Jones and Reutemann while 3rd grid place Lafitte finished 11th. Then on to Monaco, the first win for Reutemann in a Williams. His wife was there like always but this time Carlos’ daughters were present for the first time in a race track. It was also the 12th wedding anniversary for Mimicha and Carlos. Pironi took the Pole Position followed by Reutemann and Jones. The race is remembered for a memorable and spectacular crash at the start of the race when Daly collided with Giacomelli's car, which sent Daly's Tyrrell flying over Giacomelli and landing between teammate Jarier and Prost's McLaren. All four drivers were out on the spot, but none suffered any serious injury. By the moment the cars completed the first lap and returned to the place of the accident all the damaged cars had already been removed. Pironi was leading comfortably while Jones overtook Reutemann for 2nd. Jones car was losing oil on the track that added to the rain left a layer on Reutemann’s visor. He was forced to pull it up and race with his eyes unprotected. The Australian eventually retired on lap 24 with differential problems and Pironi crashed out on lap 54 leaving Reutemann in the lead followed at a safe distance by Lafitte and Piquet. Out of the 20 cars that started the race only 9 finished it and of those only Lafitte and Piquet were not lapped by Reutemann! The street track was extremely slippery due to the rain and yet the Argentine’s experience allowed him to win the race with 1 minute and 13 seconds advantage over the second car. His control of the car and the race was so great that the last lap was practically a walk in the park for him, never engaging 5th gear and going up to the Casino on 3rd. Though he could have changed his tires and put the o nes for rain he decided to go on with the slick ones. The public gave him a standing ovation. Prince Rainier III and Princes Grace (Grace Kelly, the famous actress) were there to give Carlos the trophy. Mimicha was in heaven being so close to the royalty (on those times only the winner would get to the Podium in Monaco). And to top it up Williams told Reutemann that now he was also a Championship contender (though Jones still had the main support from the British team). The Spanish GP did not count for the Championship due to a controversy between FISA and FOCA. The starting places were Lafitte, Jones, Pironi and Reutemann. At the start Jones passed Lafitte and Reutemann overtook everyone to lead the race. Jones started to drop behind with issues with his car. On lap 35 Reutemann was passing the de Villota (backmarker) on the outside when Lafitte tried to overtake de Villota on the inside. But he was too optimistic, touched the slower car of the Spaniard and sailed straight missing the curve. Reutemann, who had already passed the de Villota was finishing the turn when the out of control Laffite collected and T boned him. Both cars crashed out. Though he had dropped many places attrition at the front allowed Jones to win the pointless race. The French GP was run in Paul Ricard. Jones won from 4th place in the grid while Reutemann finished 6th having started 5th. In the British GP Pironi got Pole in his Ligier with Jones 3rd and Reutemann 4th. The Ligiers led the race but issues with the rim in their cars damaged their tires and both retired. Jones took the lead and Piquet overtook Reutmann who finished the race in 3rd position. The Renault were strong in Qualy in Germany with Reutemann 4th and Jones 5th. The French cars led comfortably till both suffered engine problems within one lap. Jones took the lead followed by Lafitte and Reutemann but a puncture forced the Australian to pit. This left the French in 1st place and Reutemann in 2nd while Jones was able to recover and finish 3rd consolidating his Championship lead ahead of Piquet and Reutemann. In Austria the fight between the Renault, Ligier and Williams continued. The Renaults again started in first row followed by the Williams. Jabouille had to pit for tires leaving Arnoux, Jones and Reutemann in the podium. The Dutch GP saw Reutemann beating Jones in qualifying. Piquet drove fantastically and won the race while Jones lagged 3 laps behind with problems with the skirts of the car. Having started 3rd Reutemann finished the race in 4th position and consolidated his 3rd place in the standings. Italy saw Piquet winning again and threatening Jones’ lead. Reutemann had started the race in 3rd place and that is the same place that he finished it. Jones, having started 6th took 2nd place. The double podium gave Williams the Constructors Championship with 2 races to go. The Canadian GP saw Piquet taking Pole followed by Jones while Reutemann started from the 5th place. The two leaders refused to give way during the first corner and caused an accident that left many cars out of the race and forcing Piquet to run in the muletto (spare car) which had a weak engine. At the restart Jones took the lead, Piquet’s engine gave up and as Pironi had jump started he was handed a penalty that put Reutemann in 2nd place. The Williams again had a double Podium and due to Piquet’s retirement Jones won the Drivers Championship. The final race of the season took place in Watkins Glen and it was the last time there. The Alfa Romeo of Giacomelli took Pole and he led the race followed by Piquet and Reutemann who had qualified 3rd. Pressure by Reutemann forced Piquet out of the race and Jones, who had had a bad start and had dropped to 14th place. From there the Australian overtook one car after the other until he reached Reutemann who was struggling with understeer due to damage to one of his tires. Getting easily to 2nd place Jones took the lead of the race when Giacomelli’s car suffered and electrical problem. The race finished with Jones 1st and Reutemann 2nd. The 1980 season ended with Jones 1st, Piquet 2nd and Reutemann 3rd. It had not been a bad season for Reutemann though with 10 consecutive races in the points (with his 6th place in France being the worst after his retirement in the 4th race of the season). But time was running out for Reutemann and things came to a head with Jones during the 1981 Championship. 1981 is the year when Reutemann came the closest to becoming World Champion. The first race took place in South Africa. Due to a conflict within Formula one (FISA vs FOCA) only the Customer teams participated. For instance Ferrari did not participate and it what was called a Formula Libre race. Therefore F1 restrictions did not count and cars raced with the banned skirts. Reutemann won the race in the rain followed by Piquet but he no one was awarded points due to the absence of the non-Cosworth engined cars (i.e. Ferrari). This would cost Reutemann dearly in the standings at the end of the year as he could have been awarded 9 points to 6 for Piquet…an extra difference of 3 points that would have given him the Championship. Thus Long Beach became the first official race of the year (instead of the usual beginning in Argentina). Several Regulations had been changed and for instance the sliding skirts on the sidepods were now forbidden. Also Goodyear decided not to participate in the European races and thus all their customers had to rush to adopt the Michelin ones. Patrese took the Pole followed by Jones and Reutemann. The Argentine overtook Jones and was following Patrese. Then Reutemann who was only 1 second behind the Italian overtook him. Patrese pitted with problems in his engine and now the leaders were the two Williams. Jones was 3 seconds behind Reutemann and started to close the gap. Due to team orders and abiding by the contract he had signed Carlos moved out of the way at the esses (some wrongfully believe it was an error under pressure from Jones) to allow Jones to take the lead till the end of the race. Piquet in the Brabham finished third. Next stop was Buenos Aires (Argentina). Piquet took Pole followed by Prost in Renault, Jones and Reutemann. The Brabham designed by Gordon Murray had now a new trick: hydraulic suspension that gave the car an unmatched performance. Piquet wont the race easily followed by Reutemann while Jones finished 3rd. Another double podium for Williams. For the first time San Marino was part of the F1 calendar. Villeneuve took pole in his Ferrari followed by El Lole. Piquet started 5th and Jones 8th. Pironi in the Ferrari led the race until Piquet overtook him. Patrese finished 2nd and Reutemann 3rd with Jones a distant 12th 2 laps behind the leaders as he had been hit from behind by the Argentine by mistake. Jones was furious at the Argentine journalists and had to be pulled out by a Williams’ team member. Later he apologized claiming he was hurt due to the hackling and insults he had received from the Argentine crowds during the race that took place in Buenos Aires. Belgium would be the last win of Reutemann in his F1 career but also a tragic race. During practice on Friday a mechanic from team Osella fell from the Pit wall just as Reutemann was driving by. The Williams hit the mechanic who was taken to hospital (dying on Monday). The drivers protested the narrow pit lane and the presence of unauthorized people in the pits. Reutemann took Pole followed by Piquet with Jones 6th. When the race was to start Piquet made a mistake taking his place on the grid and had to complete another lap to get in proper position. As cars were overheating some drivers decided to switch off their engines. When Piquet regained his place on the grid Patrese started to wave his arms to indicate that he was not able to restart the car. His mechanic raced behind it to try to get it going while the other cars started the race. The other Arrows coming from behind hit Patrese’s car sandwiching the mechanic and breaking his leg. While the marshals wanted the race red flagged and waved at the drivers on the track itself (!) the main marshal decided to continue with the race. Pironi starting 3rd in his Ferrari overtook Reutemann in the first corner but he started to fade away. Jones bumped Piquet out of the track and the Brazilian crashed. The Australian continued but a few laps later his gearbox gave up and Reutemann led the race to the end (which happened on lap 54 out of the 70 originally scheduled due to rain that started to fall). Reutemann was somber due to the accident of the Osella mechanic. At this point Reutemann had 34 points and Jones 18…he was clearly leading the infight within Williams. In Monaco Piquet took Pole with Reutemann 4th and Jones 7th. The Brazilian took the lead but crashed out late in the race. Reutemann was 4th and was trying hard to overtake Mansell. The Brit made mistake when the Argentine was overtaking him. Mansell was out and Reutemann had to pit for a new front wing. Now almost last Lole furiously started to drive to try to get to the front. But on lap 33 his gearbox gave up on him. This broke his record of 15 races in the points with Williams. Jones finished second to Villeneuve in the Ferrari. The very hot day in Spain was hard on the cars. Lafitte took Pole with Jones and Reutemann behind him. The Williams duo overtook a bad starting Lafitte and Villeneuve was 3rd very fast from 7th! And before the 1st lap was over he overtook the Argentine. Jones went out of the track and the Canadian took the lead. Carlos started to be overtaken with problems with his gearbox. He eventually finished 4th with Jones 7th in this race won with the Ferrari of Villeneuve. Piquet had crashed out many laps before. The French GP was a race to forget for Carlos. He qualified 7th with Jones 9th. On lap 58 the race was stopped due to heavy rain and then restarted. Alain Prost won his first GP, Piquet finished in the Podium and Reutemann finished 2 laps behind in 10th place with Jones out of the race on lap 77 due to a crash. It was also a significant race because Williams (along with Brabham) decided to change from Michelin to Good Year. And Michelin were the softer type that favoured Reutemann. From this point onwards good results would be far in between. When the race finished he told two Argentine journalists: “Bye-bye, the Championship is going that way…” and with his chin he pointed out to the Brabham garage… In fact I read an interview from 2007 where Peter Windsor claims that many years after racing for the team Reutemann had a meeting with Frank Williams and asked him “Why Frank?” when talking about the change of supplier. Williams said it was due to political issues. He added that Bernie thought it was better to use Goodyear because Michelin was better for Renault. El Lole was not happy with the answer and ironically told Williams: “Of course they were better for Brabham for us to use Goodyear. From the moment we changed we lost speed and grip”. From achieving 37 points in the first 7 races he only got 12 in the last 7…Reutemann at one point tried to bridge the differences with Jones who was still resented about the Brazilian incident. Jones commented the following: “Carlos says he wants to bury the hatchet and I said :”Yes, mate, right in your fxxx back!””. No forbiddance. The British GP took place in Silverstone. Jones qualified 7th, Reutemann 9th with the Renaults dominating the first row and Piquet 3rd. The Renaults dominated the race (Prost leading followed by Arnoux) and then on lap 5 Villeneuve had an accident collecting Jones and De Cesaris with Watson narrowly missing the accident. Piquet crashed (to hospital), Prost had an engine problem (spark plug) while Arnoux had issues with the Turbo leaving the race in the hands of Watson with Reutemann taking 2nd place and Lafitte completing the Podium. Now in Germany the struggles continued for Reutemann. One week before the race FrankWilliams stated that, as leader in the standings, Carlos was going to receive all the support he needed. But when the Argentine arrived in Hockenheim he found out that Jones’ political games had reversed the promise: the Australian would get the latest aero improvements and the newest engine. Though Reutemann complained Williams stuck to his new decision as Jones “was going to make his rights stand in order to win the championship to the last race”. Having started 3rd his engine with his usual chassis and the 2nd best engine (even qualifying ahead of the much better car that Jones had!) the team found a problem with the engine on the morning of the race (which was a Saturday). There was no time to make the corrections so Reutemann was forced to start the race on the spare car that had the worst of the 3 engines. Not only that but the car was not balanced properly and had no grip. At the race he had a brilliant start and took the 2nd place chasing Prost until the old engine gave up on lap 27. Jones finished 11th and Piquet won comfortably thus getting closer to Reutemann’s leadership in the standings. For Reutemann this was an important moment: he realized the team was not behind him and that he was fighting alone. Austria was not as bad…but just by a few meters! Having qualified 5th and with most of the other leaders struggling to overtake the Ferrari of Pironi (faster in in straights but extremely bad in the turns) Reutemann managed to cross the line with a dead engine and just getting there with the inertia of the car…a miraculous 5th place with Jones 4th, Piquet 3rd and Laffite in the 1st place. Had he not had the engine trouble he could have finished 4th with another critical point in the standings. Monza came next. With the Renaults and their turbo engines being the most important contenders in the fast circuit Reutemann decided to do something radical: he asked his team to remove the front wing. This gave the car more speed but less control. He managed to qualify 2nd leaving Jones and Piquet almost 1 second behind. The Italians massed around Reutemann to congratulate him as this had been a massive demonstration of guts and precision driving (a small mistake and the lower than normal control could have caused a serious accident). He started the race between the 2 Renaults. Intermittent rain prevented Reutemann from maximizing the excellent set up he had used the day before and battled hard with Prost for the 1st place and finally setting 3rd with Pironi charging up the field. Watson crashed out and Alboretto crashed into the broken off engine of the British. Reutemann also hit the debris even though he went off track trying to avoid it…in the process he lost his place to Piquet! Prost lead from Jones, Piquet, Reutemann and de Angelis. On the last lap Piquet’s engine gave up and Reutemann took his last F1 podium ever (3rd place) though the Brazilian managed to scrap a point as he finished 6th because he had completed the race distance. On the bright side Williams won his 2nd Constructors Championship in a row. …Las Vegas. This brand new F1 race was a racetrack built on the parking lot of the Caesars’ Palace Hotel. It was not liked by the drivers only to be taken off the calendar in 1983. Reutemann arrived to this race one point ahead of Piquet (49 vs 48) and Lafitte was third at 43. The only thing Reutemann had to do was to finish ahead of Piquet in order to clinch the title. There were several permutations possible and anything could happen. Carlos arrived several days earlier to check the circuit but was disgusted with it. He realized it was going to be tougher than normal to find the correct settings for the car and the tires. Regretfully for Reutemann it seems his team was not with him in this critical race. The day of the Qualy the first bad hint came when the team had received a newer engine and they put it on Jones’ car that had no chances of winning the championship. It is said that they were still trying to keep him in the team for 1982 and were trying to convince him at any cost…even at Reutemann’s. The second problem was with the chassis: #012 was Reutemann’s favourite and there was another one just arrived on Thursday (#017) but which was unknown to the Argentine. Reutemann communicated to some Argentine journalists that he wanted to use 012 because the engine had a great torque and he knew that chassis very well. When he approached Patrick Head, right hand of Frank Williams and Technical Director Journalists saw at the distance that there was a heated argument between Carlos and Head. The latter wanted Reutemann to race on 017 at all costs claiming that 012 was old and that there were technical problems with it. Reutemann prevailed and he took Pole in chassis 012! Not bad for a car in “bad shape”! Jones with the new engine was second and Piquet 4th. But when returning to the Pits he found Piquet turning slowly into a corner and both cars touched. Reutemann had the nose of the car changed…but it never worked well again. It turned almost impossible to keep the car in the correct racing line. And things then finally went Head’s way…he was forced to take 017 for the race the following day. But there was more to come. On Qualy day at 7 pm Reutemann told personally Frank Williams that there were problems with the brakes in 017…something that the mechanics had “not seen” until he asked for the car to be checked. So new brake pads were installed but these had to be set first. And the only chance that the Argentine had was during the free practice with full fuel tanks the day of the race. This means that instead of focusing on choosing the right tires for the race, he spent the morning working his brakes. Never in his career had he failed to make this critical decision less than 20 hours before a race. And the third problem showed up during that fatal half hour: the gears w ere jumping and he had to keep the stick in place with his hand for the gears not to jump. He immediately told Williams and Head. Head looked at him with disgust. 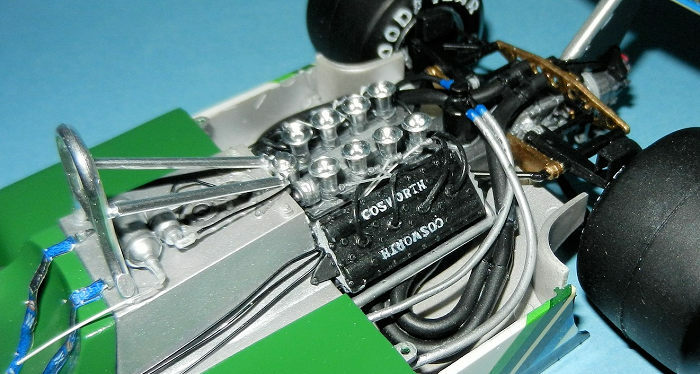 Due to the lack of cooperation he asked his own Engineer (Oatley) to do something with that gear box…for instance replace the synchronizers…to this date Reutemann does not know if anything was done but judging by the results it seems nothing was done on his gear box. When the moment of the race arrived the car was dancing all over the track. It was hard to keep it in place and the gear box was still acting up. Finally the lights went green and his car started to lag behind the others…he put first gear, second, third and when he tried to engage forth the gear jumped back to second! After the first lap he was third and he kept on losing places. Piquet overtook him on lap 17…all that would have taken for Reutemann was to crash into the Brazilian and he would have been the Champion…but he is a gentleman and refused to do that…”I would have had to live with that for the rest of my life” he later said. So Piquet was 5th, Reutemann 6th and technically even on points. Reutemann managed to keep his car close to the Brazilian till mid race. With 6 laps to go Reutemann was overtaken by Watson and Lafitte and thus fell off the points. Another driver that was behind Reutemann’s car commented that it was so unbalanced that the car would have one wheel on the air when turning…Jones lapped Reutemann and declared: “When I overtook him I had a wonderful feeling. I stayed in front of him showing him my car for him to see me. And then I accelerated leaving him behind. I am better. There is no question about it. Now we can say that the only place where he can compete is for Miss Argentina”. The race was won by Jones and the Williams team celebrated like mad…ignoring the tragedy on the other side of the garage as Reutemann had lost the Drivers World Championship by just one point. Shattered and full of anger he went to the hotel room. His hand was bleeding due to the efforts to keep the stick in the correct gear. Patrick Head denied there was anything wrong with the gearbox having checked it after the race but most every source and biographer does not agree with him. The car had a problem like Reutemann had indicated and team Williams did nothing to fix it before the race. Frank Williams could not care less. His team had won the Constructors Championship and the rest was a problem between his drivers. His thought was that he was going to let Carlos cool down during the winter. Reutemann was approached by Fiat during the 1980 F1 season with an offer to drive a Fiat 131 in the inaugural 1980 Codasur Rally (now Rally Argentina) where he finished in third place. In 1985 he accepted another offer to drive the Argentinian Rally, this time driving a Peugeot 205 T16 Reutemann again finished in third place. He started in politics becoming Governor of his Santa Fe Province (1991-1995) and being reelected after a term not in office (1999-2003). Not surprisingly he became of the main political referents in Santa Fe. He played many times with the idea of running for President. Finally in 2003 he became Senator for Santa Fe and he still holds his seat. On January 1, 2006 Reutemann was named Commendatore della Repubblica by President of the Italian Republic Carlo Azeglio Ciampi for his services to Italy while being part of Scuderia Ferrari. To “El Lole”, who gave us so many satisfactions so many years ago and still make us proud…THANK YOU! The Tamiya kit as an old one from 1980. 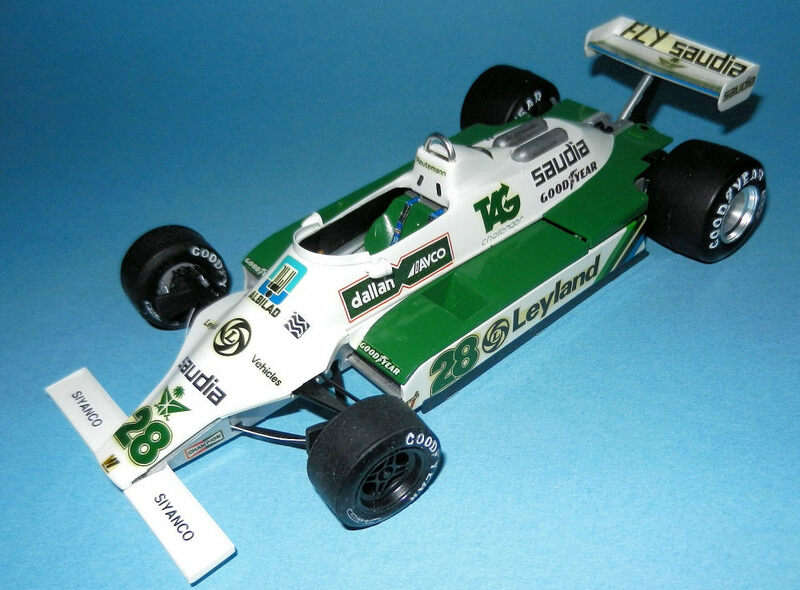 It can be built as a FW07 from 1979 or early 1980 because it has the tall side pods. Decals are for Regazzoni, Jones or Reutemann but after so many years they had yellowed. It has all the engine parts typical of Tamiya with GoodYear tires. Typical Tamiya quality with great fit, no flash and easy to follow instructions. Though this was my third F1 model doubting I will ever build another one. Planes are my stuff! I assembled all the major and minor components of the engine based on what colour they were to be painted. 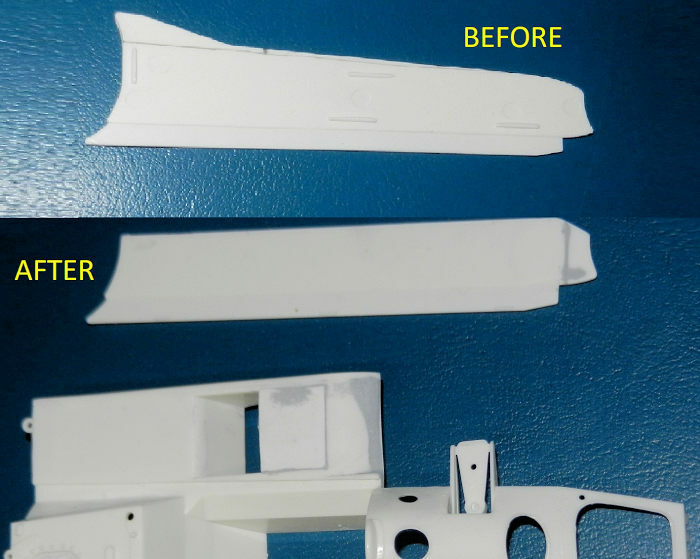 Then using Model Master Acryl all the subcomponents were spray painted following the instructions. The engine went together with little problems and the flexible pipes/wiring supplied by Tamiya were glued in place. 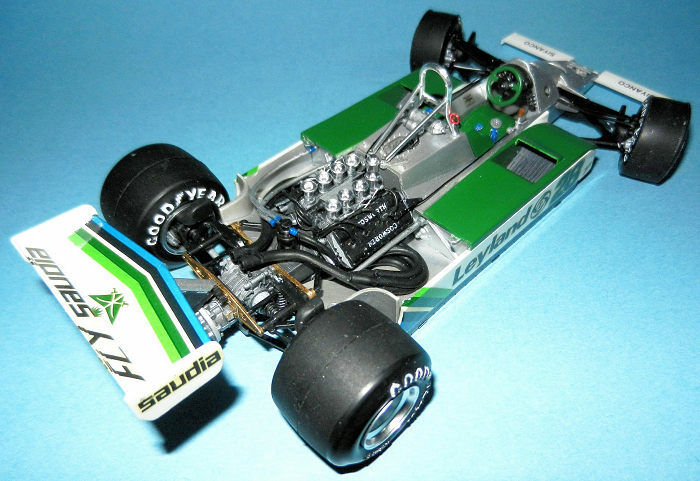 The chassis is very easy to put together but requires several modifications to convert it to a FW07B like the one used by Reutemann to win in Monaco 1980. The side pods did not have the tall wall going towards the rear tires. I cut this part off in order to give a flat and rounded union to the top of the side pods. This had to be done on the front and back sections of the side pods. Towards the front of the walls of these there is also a panel that needs to be removed with putty. Then in the FW07B the exhausts for the radiators on top of the side pods are different in size and don’t have the doors except for one on the right side. Also, the “border of attack” of the top part of the pods is longer matching the sides. This I created by using plastic card and sanding it to shape. There was some putty required in several areas due to this conversion. There was a small intake on the left side on top of the back of the sidepods. Using Evergreen I made this part that seems to feed another one that protrudes just under the hood which I also had to scratchbuild. Another easy modification was the inclusion of a “blind” short windshield that I made using a strip of Evergreen. The body of the car received a coat of White Premier (ModelMaster Acryl) followed by several coats of ModelMaster Gloss White. The floor (undersides) and interior of the body were painted in aluminum. The trickiest part was to find a green that matched the one used by Williams. There was nothing in the ModelMaster Acryl range so I was forced to buy Mr. Colour Green (6) and their thinner thus I had to move my tools and compressor to the shed in order not to fill the basement with the fumes. 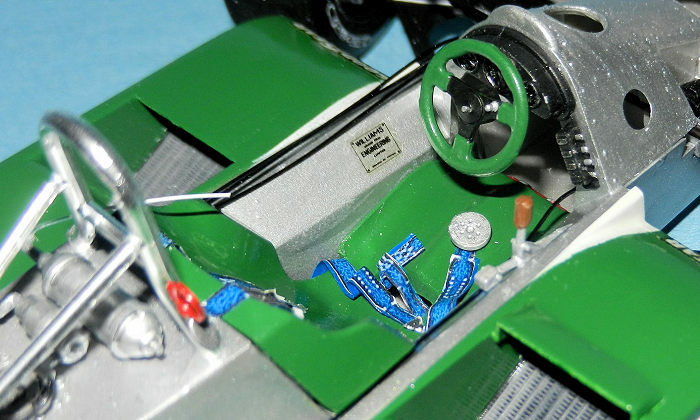 Strips of aluminum foil were brush painted in blue to represent the seat harness. The particularity of the Tamiya decals is that they really need to be soaked in warm water. Else it takes ages (if ever) to release from the backing paper. Attention had to be paid to the actual decals and position on the car because there are small differences from race to race. In fact, there are several decals that are needed for the Monaco car that are not present in the Tamiya sheet. So I searched the web for all the pictures of this car from the proper angle to avoid distortions in order to create my own decals using our ink jet printer and white decal paper. 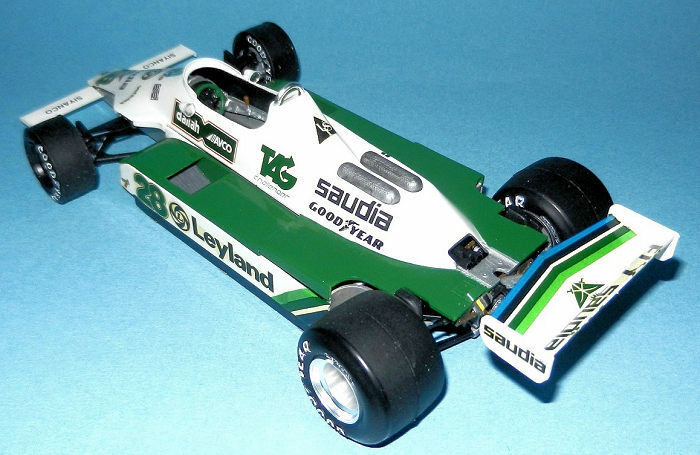 The markings I made were: Daillah Avco under the cockpit, Saudia and Good Year above the engine, Challenger below the TAG decal, Siyanco for the nose wings, Saudia on the nose of the car, “Wiggly” squares beside Albilad on the nose, Green background and white font GoodYear for the intakes on the sidepods, Seat belts including the Willians brand, the two angled and elongated holes on top of the back rest. I had to do several prints with different hues in order to match the colour of the paints as close as possible. After giving them a coat with the liquid decal solution from the same manufacturer of Set and Sol I was able to trim them very carefully and apply them. Micro Set and Sol were used to help the decals conform to the body of the car…and a day later a coat of Future sealed the decals. Seat belts made with aluminum foil and the above mentioned decals were installed using a round part of the spares painted in silver for the quick release system. A couple of triangles of photoetched from the spares were used as attaching points behind the seat. I glued the front and back wings, attached the wheels which had the Good Year wording painstakingly painted in white with a brush and presented the hood. The FW07B victorious in Monaco was finished! A very good kit that allows you to build different variants of the early Williams cars if you are willing to put some extra work on it.